Procession of Peace on Palm Sunday led by St. Paul’s Lutheran Church. 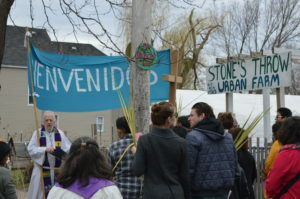 Each year, St. Paul’s Lutheran Church and its Semilla Center for Healing and the Arts sponsors a Procession of Peace on Palm Sunday. Attendees walk through the neighborhood, stopping to lift up concerns of the community, such as safety, the environment, youth, immigration and poverty. “Especially this year, with all the division in our society, we are committed to walking a different way: one of welcome and justice,” say organizers. All are invited to this year’s walk on Sunday, April 14, noon, St. Paul’s Lutheran Church, 2742 15th Ave S. For more information, call 612-724-3862 or e-mail stpaulscreate@gmail.com. • Thursday, May 9: 5-8 p.m.: Semilla and St. Paul’s Night at Midtown Global Market: Poetry by youth and adults, a youth photography show, music and more. • Saturday, May 18: 9 a.m. to noon: “Pollinate Phillips”. Pant pollinator attracting plants and art in boulevard gardens in the community. On the first Sunday of May, tens of thousands of folks will celebrate a day of community and festivity together. All this takes place because – and only because – hundreds of volunteers pitch in to make it happen. Register to be a 2019 MayDay volunteer. Heart of the Beast offers group volunteer opportunities for churches, civic organizations, and businesses. Contact Volunteer Coordinator at volunteer@hobt.org for details. It is time to start collecting bags, brown paper, newspaper, tubs, plastic bags for use during the build workshops. Bring these supplies to upcoming workshops starting April 6. On Saturday, April 6, Tom Neilson brings his satire and social commentary to a Climate Justice Fundraiser co-sponsored by MN350 and MNIPL to stop the construction of Line 3, a proposed tar sands oil pipeline that would cross the Mississippi headwaters as well as Ojibwe treaty territory and have a climate change impact equal to 50 coal plants. Neilson will tell you he is just a farm boy with a guitar who likes a good ball game and human rights. The 7 p.m. concert is at the Spring House Ministry at 610 West 28th St., Minneapolis. There is a suggested donation of $10 – 30. For more information, contact Bonnie Beckel 612-722-6473.